If you have examined the guild calendar, you might notice the last event of March is Ulduar. This is not just any old Ulduar raid. This is a Herald of the Titans raid. For the few people in the back who aren't quite sure what this is, let me explain. Step 1: Level a toon to 80. Step 2: Freeze its XP. You do this by going to the rogue in the battle room in Stormwind Keep. Step 3: Accumulate gear no higher than ilevel 100. Step 4: Sign up for the March 30th event. 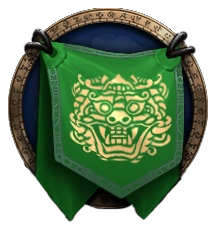 Step 5: Down Algalon and all your toons have the "Herald of the Titans" achievement. 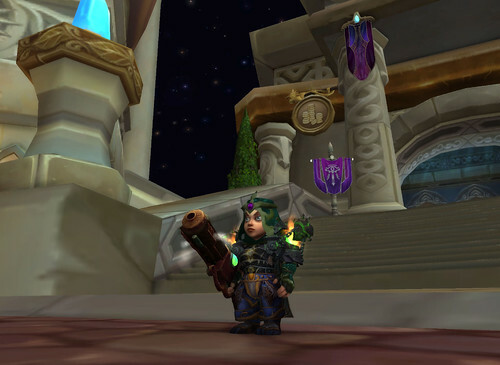 Here is lil'Gimm all ready for Ulduar with the exception of gems and enchants. I got the title on Epicurian, but I'm ready to go again on this character since big Gimm was too big when we decided we wanted to do this. Your gems and enchants can be Cataclysm quality and we have a number of people who can make the right gems and enchants for you. Just tell us you're ready and we'll mobilize. You have four weeks and with the faster leveling, even if you make a character this week, as long as you stick with it, we can have your character ready to go. A lot of people have toons from the last time we did this still at level 80 and willing to run this again for those who want the title. These little-played toons can go into the storage guild, Eats Bacon, if you want to keep it just for Legacy events. I will be needing Cataclysm-era herbs, fish and meat to cook and make flasks for this group. If you have some to donate or wish to help, those are good things to farm and stick on the first tab of the bank. The Algalon fight is one of my favorites. I love the introduction to it and it's just cool. If you have questions I didn't cover, ask here or hit up myself, Mizauki, or Tarsan and we'll be happy to answer them. Depending upon interest, we can do this again in April if you can't make the March event, but I think we're getting down to not many people needing this anymore so the Legacy group is going to turn its attentions to a different raid. Hello Arthas.